Rupayan Land Development Limited Job Circular 2016 has been published in national daily newspaper. They are requite 45 post in 9 positions. 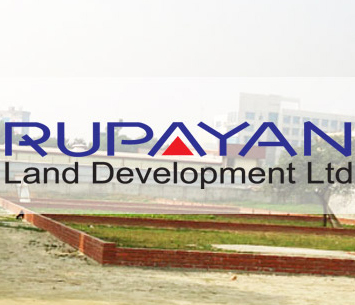 Rupayan Land Development Limited Job Circular 2016 was published recently. You found here all kinds of information about this job. Rupayan Land Development Limited Job Circular 2016 was published. If you are interested and eligible then apply now. Post and others information are given below. Responsibility: To be responsible for running the overall operations with an emphasis to implement the policy and work program related to Marketing, Sales, Credit realization, Project Development, Administration, Land, Projects etc. Educational Requirements: Masters/ MBA from any reputed public or foreign university. Experience: At least 12 years of which 5 years in Director position with proven track record in renowned land development companies. Responsibilities: Land procurement and related affairs of RLDL including leading a team of experts. Adequate knowledge on all type of legal and regulatory issues regarding land procurement for large and small projects. Educational Requirement: Masters/MBA from any reputed public or foreign university. Experience: At least 12 years of which 5 years in similar position with proven track record in renowned land development companies. Responsibilities: To be responsible for supervising a team, organizing the cost and financial data for internal and external matters and must be capable of handing the entire accounts including banking functions independently. Educational Requirements: Masters in Accounting/Finance with CA/CC, CA(inter or qualified) will get advantage. Experience: At least 10 years service experience in Accounting and Finance of which at least 3 years as AGM/Manager with proven track record in renowned land development companies. Responsibilities: Lead a team of staffs and achieve given sales target. Educational Requirements: Masters/MBA from reputed university(major in Marketing). Experience: At least 10 years working experience in similar job in renowned land development companies. 05. Manager Sales ( Post-3). 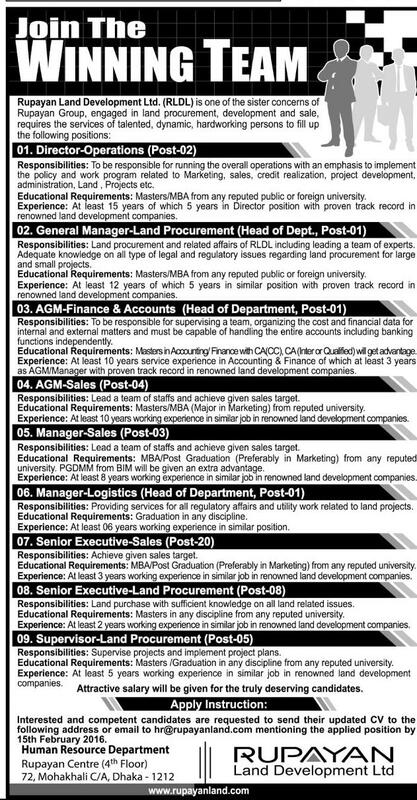 Educational Requirements: MBA/Post Graduation ( preferably in Marketing) from any reputed university. PGDMM from BIM will be given an extra advantage. Experience: At least 8 years working experience in similar job in renowned land development companies. Responsibilities: Providing services for all regulatory affairs and utility work related to land projects. Educational Requirements: Graduation in any discipline. Experience: At least 6 years working experience in similar position. 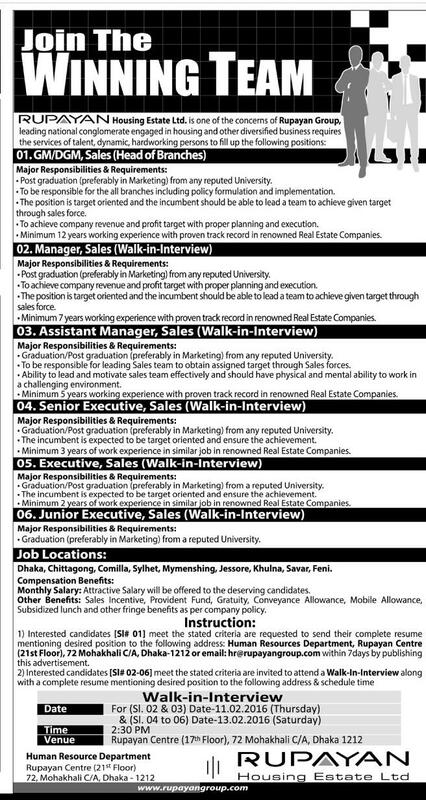 Educational Requirements: MBA/Post Graduation (preferably in Marketing) from any reputed university. Experience: At least 3 years working experience in similar job in renowned land development companies. Responsibilities: Land purchase with sufficient knowledge on all land related issues. Educational Requirements: Masters in any discipline from any reputed university. Responsibilities: Supervise projects and implement project plans. Educational Requirement: Masters/Graduation in any discipline from any reputed university. Experience: At least 5 years working experience in similar job in renowned land development companies. Interested and Competent candidates are requested to send their updated CV to the following address or email to [email protected] mentioning the applied position by 15th February 2016. Address: Human Resource Department, Rupayan Centre(4th Floor) 72,Mohakhali C/A,Dhaka-1212. If you need more information then go to Rupayan Official Website. See the circular here Another job circular has been published Rupayan Housing Estate Limited. You can see detail information the circular. Rupayan Housing Estate Limited Job Circular given below.